As a newer teacher still learning the ropes, Brittney Norman had a lot to think about going into this school year—but she worried most about one thing: how to fit her favorite part of the school day into a new schedule that didn’t leave much space for “morning meeting” time. The fifth-grade teacher likes to run a sort of check-in first thing each day to provide a chance for kids—and herself—to unload worries they’re carrying around. Third-year teacher Brittney Norman belongs to MEA for the extra support–it’s nice to know there’s always someone there to help when she needs it, she says. However, systemic changes at her school threatened to bump that priority right off the schedule. Before the year started, Norman looked forward to sharing teaching responsibilities with a few more experienced teaching partners by rotating students across different classrooms a few times a day. But she expressed her fears during a summer planning session with the others. On the Tuesday after Labor Day, Norman began her third year in the classroom—but in many ways she started over again. New school district. New curriculum. New students. Norman, 29, is re-navigating first-year overwhelm at Pine River Middle School after spending her first two years as an educator at Mackinaw Trail Middle School in Cadillac. The switch in districts meant she had to construct a classroom from scratch (on the fly, since her building was closed from construction until late in August), while learning a reading curriculum she’d never taught before. 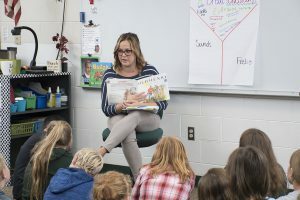 One thing is familiar: many of the teachers she’s working with at Pine River Area Schools she knew growing up in the rural region south of Cadillac. That’s why she applied when a job came open. She wanted to come home, where her young daughter attends school and her family lives. “It’s nice that I do know everyone—I can ask those questions and not be the new kid that doesn’t know anything and doesn’t want to ask anybody,” she said. Still, there’s no getting around the challenges faced by early career educators like Norman. At one point in her second year of teaching, she started tracking the hours she worked—routinely 70 hours a week, sometimes more. A math and science whiz in high school, she’s carrying nearly $70,000 in student loan debt for her Bachelor’s degree from Baker College, after she tried and rejected multiple career majors before deciding to pursue her childhood dream of teaching. “When I graduated high school, everyone told me there’s not enough money in teaching, so I tried a lot of other things first,” she said. She didn’t expect to encounter the sorts of social and economic troubles she’s seen among students struggling with homelessness, water service shut-offs, and hunger. Like many school employees, she goes home and worries about those kids. “It’s hard to go to sleep at night sometimes, knowing what you know about your kids and what’s going on at home with them,” she said. An innovator who loves trying new tools and strategies—the flipped classroom, Google classroom, individualized instruction—Norman tries to keep failures in perspective (“After it’s done, it’s done; I try not to get too worked up about it”). But she struggles—as many educators do—to cope with some parents who make unrealistic demands or lash out irrationally to place blame on the teacher instead of working together to find solutions to their students’ problems. She laments the three weeks of learning time her fifth graders lose to standardized testing as “terrible” and questions expectations that some 10-year-olds aren’t developmentally ready to meet. For example, a child who hasn’t mastered multiplication facts will struggle to add and subtract fractions with unlike denominators. “They’re being tested on things I didn’t learn until seventh grade,” she said. Her biggest struggle, however, remains in finding a classroom management plan that works for her. Last year, she heard about various systems from her NEA-MEA project mentor and tried a tally system with rewards. The problem was she sometimes forgot to mark tallies in the mix of all the other tasks she had to do and monitor at any given moment. Her goal is to create strong relationships with her students that create a bond of respect, so reward systems aren’t necessary. For now, though, she’s trying out a “clip-up, clip-down” system used by her partner teachers in Pine River. Her school year started a little rough. She couldn’t find time for her morning meetings in the opening days, worrying about falling off pace. Lessons that worked in her old school were flopping in the new one. The kids seemed squirrely. She was working every night until 9 p.m. trying to make changes. Then she decided to do what she knew would work, even if it meant she fell a little behind. She paused to check in, took a few moments to hear from kids carrying worries around or to notice the ones not speaking up—and things got better.